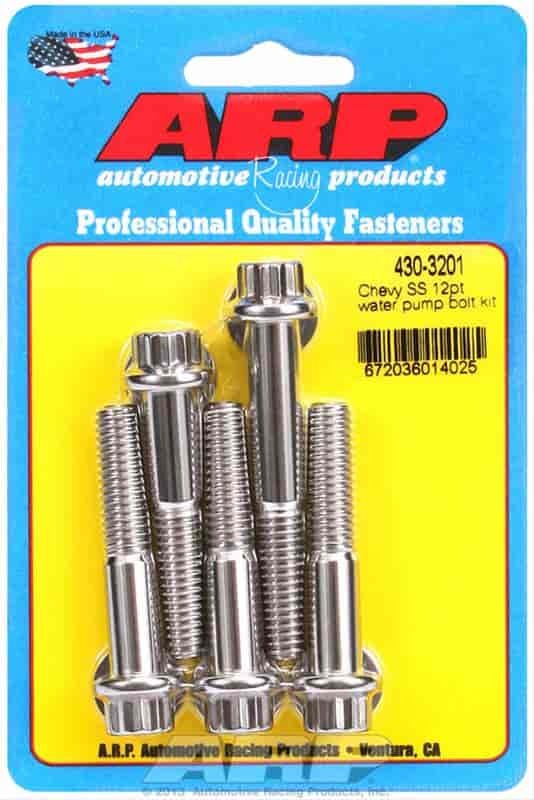 Milodon 81400 - Oil Pan Studs Universal 1/4"
ARP's Timing Cover / Water Pump Bolt and Stud Kits deliver unmatched performance and safety for both street or strip vehicles alike. These bolts are forged from aerospace alloy and heat-treated, thread rolled and machined. Bolt and stud kits are available in either black oxide finish or polished stainless steel for rust prevention and lasting durability. Bolt Kits: Available in polished stainless steel or black oxide finish chrome moly. Standard hex head or compact 12-point. Stud Kits: Preferred by may Pro engine builders because they eliminate the chance of pinching gaskets. Contribute to easier engine assembly. Features the special ''bullet nose'' to guide the nut accurately in place. Available in black oxide finish 8740 chrome moly or polished stainless steel with hex or 12-point nuts. Does ARP 430-3201 fit your vehicle?